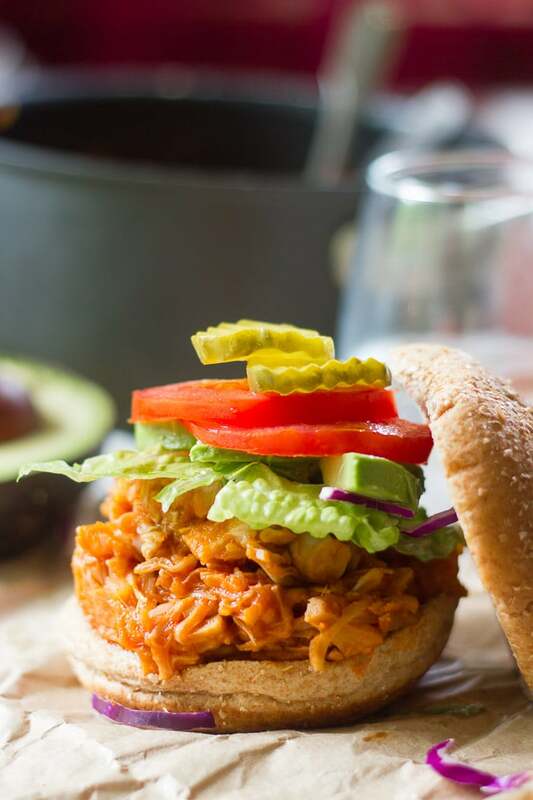 Tender jackfruit is simmered in spicy maple Buffalo sauce and stuffed into buns to make these mouthwatering pulled jackfruit sandwiches. These sandwiches were initially going to be sliders. I’ve never made sliders, so obviously I don’t have any slider recipes on the blog, and I thought it seemed like about time I changed that. I even went out and bought some slider buns. And then I realized I don’t really think sliders are that great an idea. Maybe that’s why I’ve never made them before! When I want a sandwich I want a full-sized sandwich. A mini sandwich seems like a tease. Do people who eat sliders eat two or three of them? Somehow that still seems unsatisfying, and I’m not sure what the bread to filling ratio of two or three sliders would be in comparison to a regular sandwich, but I have a feeling it’s not great. So at the last minute I stuck my slider rolls into the freezer in exchange for some good old burger buns. Maybe I’ll change my mind about sliders down the road, but I think I’m more likely to turn my slider buns into some bread pudding. In other news: Trader Joe’s has jackfruit! One more reason to love TJ’s. I spotted it among the other canned goods on a recent trip and I couldn’t be happier. One reason I haven’t posted too many jackfruit recipes on this site is because I know lots of readers have trouble finding the stuff. Asian markets usually carry jackfruit as well, but not everyone has an Asian market nearby. And okay, not everyone has a Trader Joe’s nearby, but I think between the two sources most of you guys will be able to get your hands on some jackfruit. Jackfruit is taking over! Yay! 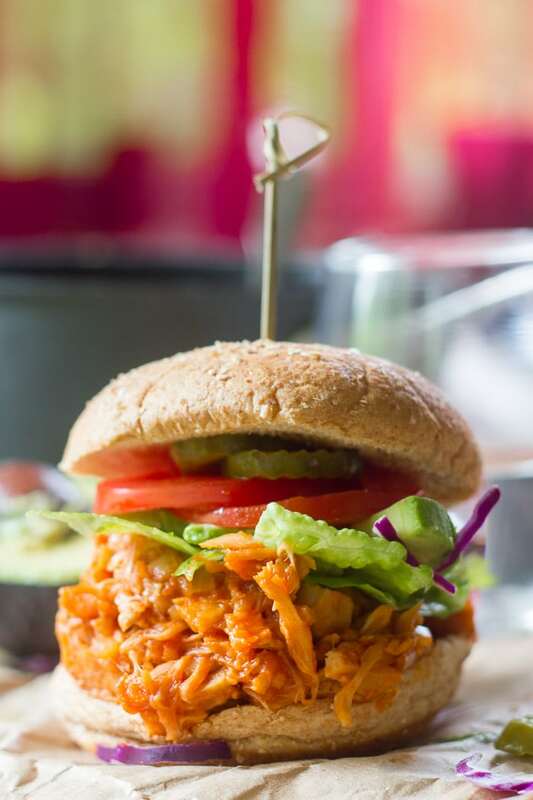 Since there are a million pulled jackfruit recipes around I wanted to do something a little different, and I’ve been itching to do a summery Buffalo sauce recipe, so Buffalo pulled sandwiches it is! If you’re into spicy with a little sweet I think you’ll love these guys. 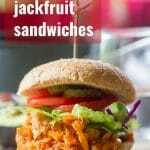 Make sure you use unripe jackfruit (also may be labeled young and/or green jackfruit). The ripe stuff is sweet and not ideal for use as a meat substitute. Frank’s brand hot sauce is the best one to use for this recipe (or anything Buffalo, for that matter). You can use another brand and it’ll still be delicious, but won’t have as much characteristic Buffalo flavor. Make the filling ahead of time and reheat it for an easy make-ahead lunch or dinner. Coat the bottom of a medium saucepan with oil and place it over medium heat. When the oil is hot, add the onion and sauté until soft and translucent, about 5 minutes. Add the garlic and cook about 1 minute more, until very fragrant. Add the jackfruit, hot sauce, maple syrup, tomato paste, liquid smoke, and 1 cup of water. Stir well, bring the mixture to a simmer and allow to cook, uncovered, for about 20 minutes. Stir every few minutes and after about 10 minutes begin using a couple of forks to break up and pull apart the pieces of jackfruit. It should be stringy and tender by the time it's done cooking. Continue to simmer until the jackfruit is very tender, about 20 minutes total. You can add a bit of water during cooking if the sauce gets too thick. 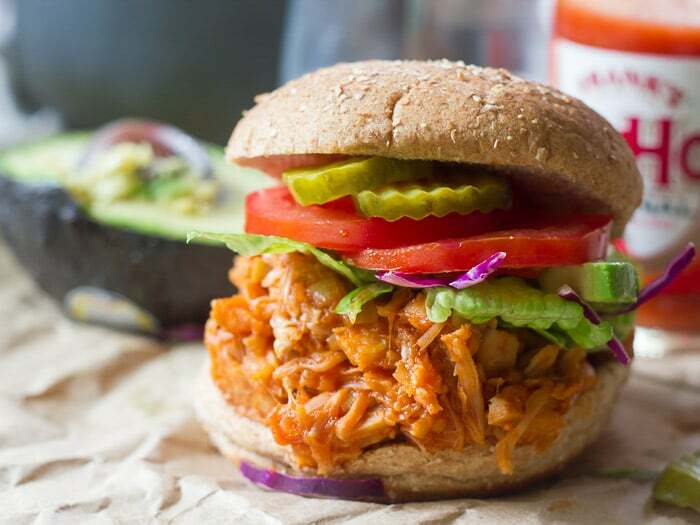 Divide the jackfruit among the rolls and top with toppings of choice. Serve. Some people like to remove the cores and seed pods from their jackfruit before cooking. I don't, because it's time consuming and just adds some additional texture to the final product. Feel free to remove them if you like. I made this for dinner tonight–found the recipe on Facebook while on the bus home from work. All the ingredients were on hand and it was easy and quick to make. My family enjoyed the meal and would like to have it again. Next time I will be sure to have something sweet to go with since it was a tad spicy. I’m thinking pineapple or mango to add to the sandwich. Pineapple or mango would be delicious! I’m glad you enjoyed it! I made these this evening and sauce for this was absolutely INCREDIBLE! Next time I wonder what else could be used instead of the Jackfruit? This is the forth jackfruit recipe of your’s that I’ve made. Each one turned out great. I live in Panama, and our jackfruit doesn’t come in a can (a 20 pounder costs $5.00). I’m guessing, but two 20 ounce cans is about four cups. It would be nice for a conversion to cups. I’m glad you enjoyed them! And I’ll measure it out so I can include the conversions next time I make something with jackfruit! Made these for dinner tonight as my partner loves all things spicy. He added pickled jalapenos and hot sauce to his… not sure if I’m quite ready for that level of commitment but the standard option was yummy for me! I had to boil mine a bit longer than 20 minutes for the sauce to thicken enough but my guess is that because I remove the core and seeds I had a lot less jackfruit than you to soak up the mixture. Next time maybe I’ll add a 3rd can to compensate for this. Oh yum!! I love the idea of adding pickled jalapenos! I’m glad you enjoyed it! I’m going to try your jackfruit filling in some tamales! That sounds delicious! I made jackfruit tamales last year and they were excellent! Enjoy and I’d love to hear how it works out! Can this be made with a fresh, ripe jackfruit? The ripe ones are sweet, & generally not used in this sort of recipe. I have 10 pounds of it in my freezer. (I didn’t know that ripe ones are sweet.) 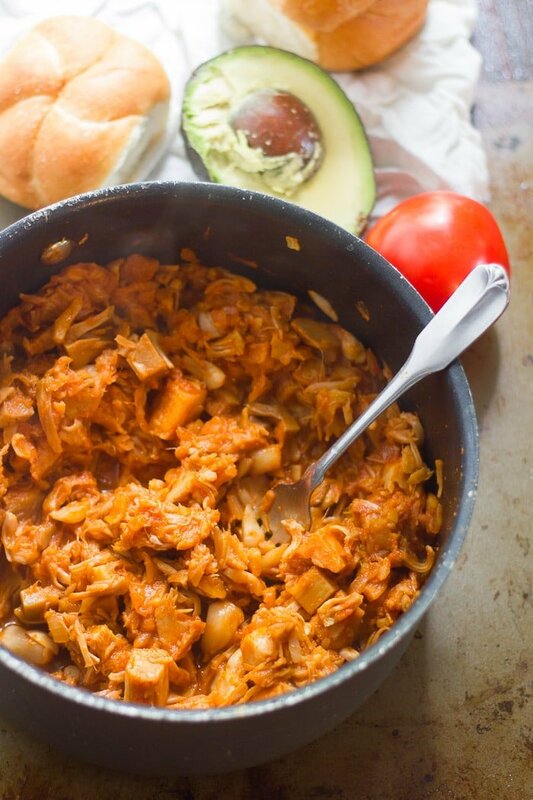 I’ve been searching for a typically savory jackfruit recipe where I can use my sweet jackfruit. You can use a fresh jackfruit, but not a ripe one. As far as I know, savory recipes only work with unripe ones. I’ve never used a ripe one before, but I hear they are good in smoothies! We really enjoyed this recipe as an alternative to our usual TVP Sloppy Joes. Next time I’ll use a potato masher to “pull” the jackfruit while it’s simmering. I served this with steamed sweet potato, which complemented the spiciness of the jackfruit nicely. So happy to find your blog since I’m tired of all my old vegan recipes. That sounds like a delicious meal! I’m so glad you enjoyed it!